A kitchen tool, typically made of materials such as wood, metal, or silicone plastic, that are specifically constructed to withstand high temperatures when used for baking or cooking foods. There are several types of spatulas that are used for different purposes. One type is made with a handle attached to a flat blade or a spoon shaped blade. 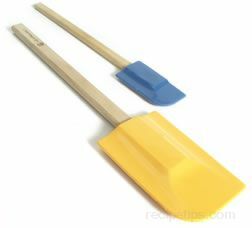 The straight shafted spatulas are most often used to spread toppings, scraping food from the sides of pots and mixing bowls, stirring ingredients in curved bowls, or folding ingredients into each other. They are generally made of a flexible silicone plastic or rubber that can move easily around and form into the shape of the bowl, pan, or pot containing the ingredients. The heat resistant spatulas are made to withstand high temperatures, exceeding 400 degrees, providing an all-purpose utensil to assist with meal preparation. Straight metal spatulas are most often made for spreading food toppings. Another type of spatula is one that is bent at an angle and is generally used for turning or flipping food. They are made of plastic, nylon, silicone, metal, or stainless steel. The size or shape of the spatula will often depend on the intended use of the spatula. The larger wide spatulas are used to turn, lift, or serve a portion of food. The smaller length spatulas work well for lifting and serving smaller food items such as quiche, pie, or cakes.